Metal arch address plaque made in USA from handcrafted aluminum. This house number plaque holds up to five 3" numbers. Choose from black with gold characters, green with gold characters, white with gold characters, red with gold characters, antique brass with antique brass characters, black with silver characters, black with white characters, antique copper with copper characters, bronze with gold characters, pewter with silver characters, and oil rubbed bronze with oil rubbed bronze characters. Size: 15.75" x 9.2" x .375". Mounting hardware included. 5-year-mfg. warranty. Please note that the image preview is only a rough representation of the finished product. Refer to main image for how a finished product will look. Please allow approximately 2 weeks for production. 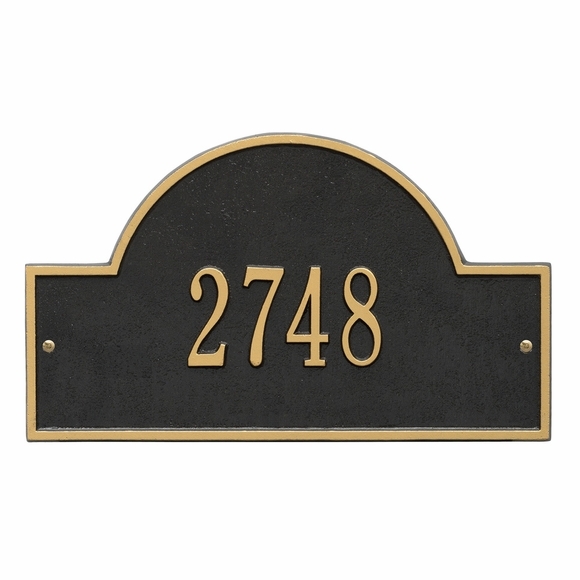 Beautiful house number plaque. Good quality and arrived quickly. Will install this weekend.